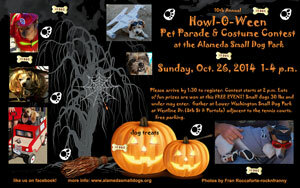 The Alameda Small Dog Park Website - Just for Dogs 30lbs and Under! Howl-O-Ween 2011 was fantastic!! Thanks to all the contestants & spectators who showed up to enjoy the festivities today!! See the photos in the photo section of our Facebook ! 2015 Howl-O-Ween out but look for us next year! May your days be filled with comfy pads to lay on & juicy bones to chew! We're always looking for your cute small dog pictures! Send them to the gallery here! July Parade was great fun! See the pictures here. Looking for pictures of some of our past events? Check the archives!